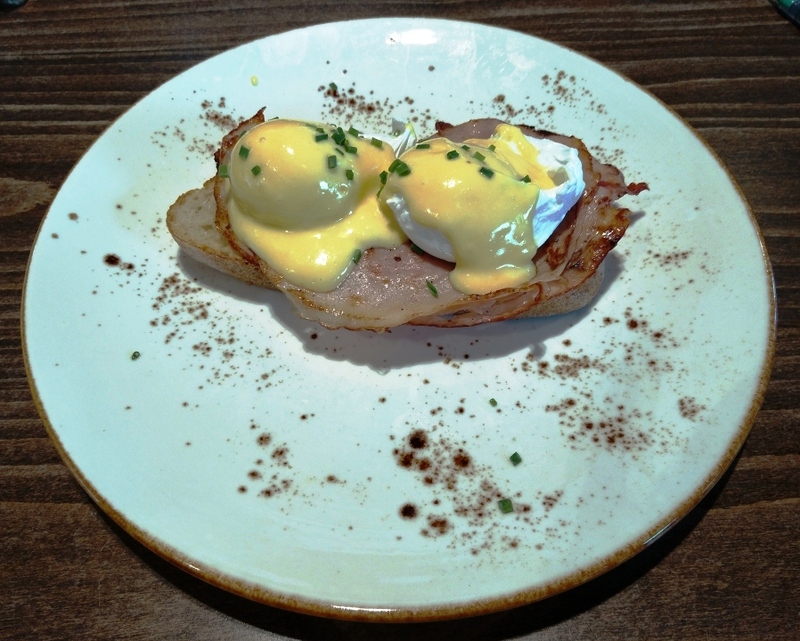 I recently got involved in an interesting discussion about what makes a perfect Eggs Benedict (now commonly known as Eggs Benny). I was at a Pialligo Estate Academy masterclass and we had spent the morning creating a range of delicious sauces and dressing. 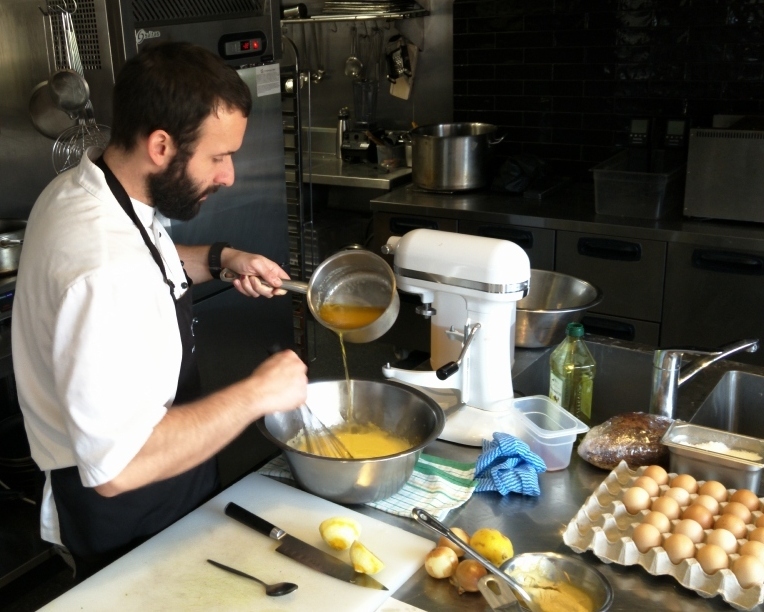 The grand finale was conquering an authentic Hollandaise Sauce, consisting of butter – lots of butter – and eggs. Walking a group of enthusiastic foodies through the process of emulsion sauces, chef Stuart Strutt-Shotton created a perfect light and fluffy sauce, quickly poached some eggs and served them up as a snack on sourdough bread. The making of any emulsion sauce is almost a ritual and is not for the impatient. If the principal ingredients are eggs and butter, then adding anything other than the right amount of light whisking and heat, could result in very rich scrambled eggs! OK, so these weren’t authentic Eggs Benny because there wasn’t any ham available, but they were delicious and ticked a number of boxes, especially the freshly prepared Hollandaise with a hint of chives. Needless to say, these snacks didn’t last long. I know that half the cafes in Canberra serve this dish, so I thought I would try a few of the haunts recommended by my Masterclass friends and some of the RiotACT team. Following is a short list to get your taste buds tingling but before I tantalize everyone with my most enjoyable search, I did a bit of investigating into the origins of Eggs Benedict. In 1942, The Smithsonian Magazine published an article claiming the dish had its roots in a man named Lemuel Benedict, a Wall Street stockbroker known for his partying habits. After a particularly long party, Lemuel found his way into the Waldorf Hotel and proceeded to concoct a dish of two poached eggs, bacon, buttered toast, and a jug of hollandaise sauce. This dish came to the attention of the maître d’hôtel Oscar, who sampled the dish and, with a slight adjustment, put it on the Waldorf menu. The rest is history. I think we just have to accept this great dish is the invention of an American and nearly 120 years later it is still a firm favourite in Australia, featuring regularly on the menu of many local Canberra cafes. It has a number of variations and some even have different names: Eggs Hemingway is traditionally served with smoked salmon (a summer favourite of mine), and Eggs Florentine replaces the ham with spinach. 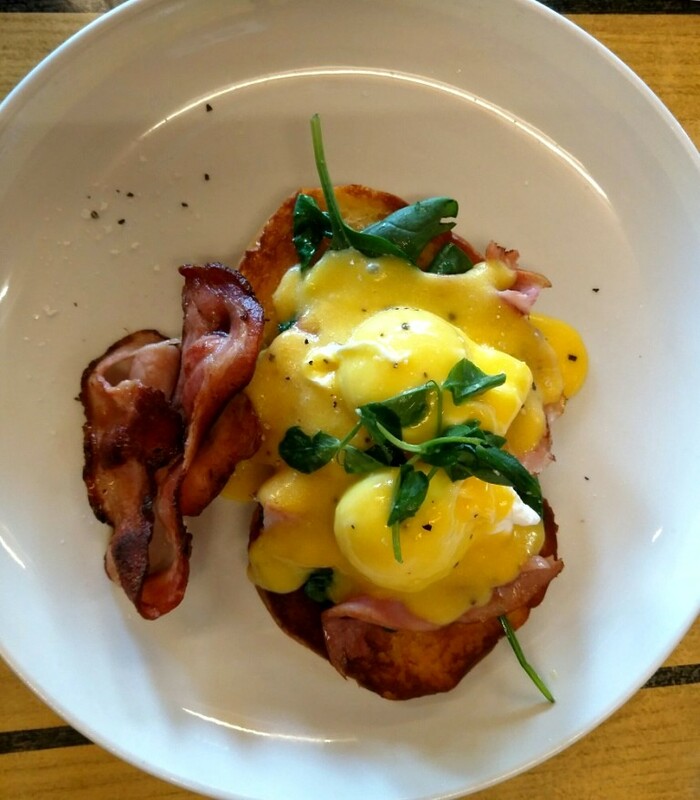 When I sought advice from various foodie friends, EQ Cafe in Deakin was one of the most often mentioned and recommended breakfast destinations. I popped in one very busy Saturday morning and was lucky to get a table. I love English muffins, but the sourdough bread used was baked in house. Even though I could have had spinach and bacon, I decided to stick to the simple and original ingredient of ham. The “Grandfather’s Ham” had been lightly friend, eggs impeccably poached and the Hollandaise Sauce was freshly prepared, rich and buttery. Most importantly it was served hot on an attractive plate. Urban Pantry on the lawns at Manuka won my heart with the lightest and most fluffy of sauces, and I chose an accompaniment of a great Canberra favourite, Pialligo Bacon. The traditional English Muffins were lightly toasted, unbuttered and the Hollandaise Sauce was lightly dusted with freshly chopped parsley. On a cold morning, it was a perfect breakfast. I don’t get to Manuka often enough. I love the Manuka Lawns, even mid-winter when the beautiful leafless trees take on an almost sculptural form and the outside tables are mostly sheltered from winter draughts. A fellow ‘Benny’ lover decided I should go to his favourite haunt. I immediately loved the Meating Room. The cafe, bar and grill spacious, the very good coffee arrived quickly and after we ordered, there was a respectable distance to allow the Hollandaise Sauce to be freshly prepared. The eggs were perfectly poached, the double smoked ham warm and salty, and the milk bun, a slightly quirky bent on the normal dryer English muffin, was wickedly fried in a bit of butter. I ended up with a side order of very tasty, crispy bacon, wilted spinach and a bit of peppery watercress. This is a relaxed, friendly place for locals and I can see why it has become so popular. 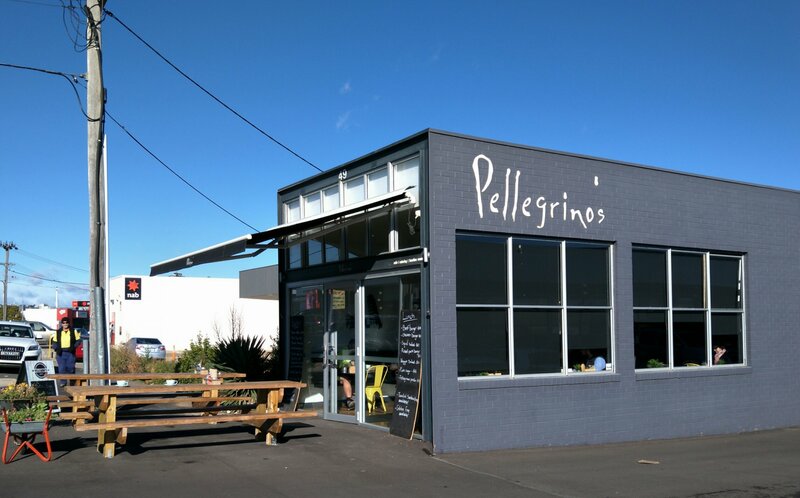 The morning I went to Pellegrino’s in Fyshwick, described by many as the most popular breakfast spot in Fyshwick, I delegated the ordering and tasting of the Eggs Benny to a hungry dude who managed to consume half of the dish while I was outside taking a photo! Despite the below freezing start, patrons were sitting outside, tucking into full breakfasts and mugachinos. The “Benedict” didn’t pretend to be classic. With the rich Hollandaise Sauce just lightly drizzled across the top of the properly poached eggs, perched on top of lightly toasted sourdough, it came with a big portion of tasty bacon, not too crisp. Served with shredded uncooked spinach, and washed down with a good flat white coffee, Pellegrino gets a big tick for their “Benedict” breakfast dish and a sunny start to even the coldest of days. 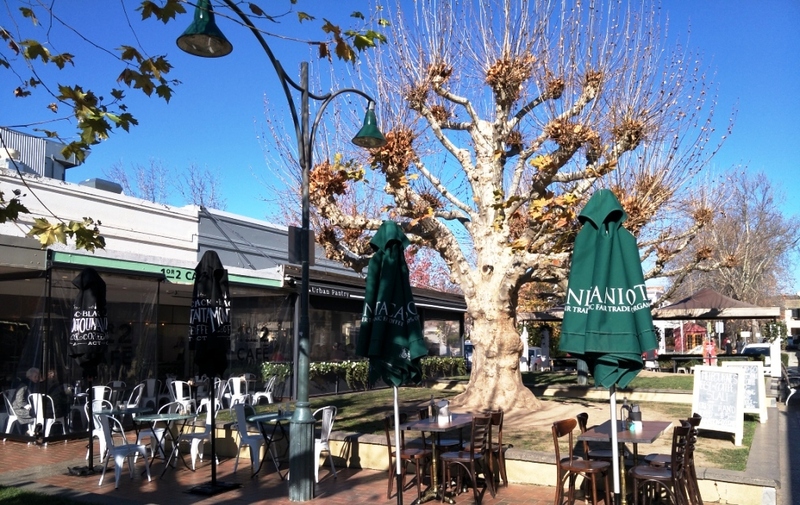 Other recommended cafes include Tilley’s of Lyneham, 1 and 2 Cafe in the old Grande’s spot on the Lawns at Manuka, and I noticed Eggs Benny on the menu at the Station Stop Cafe at the Yarralumla Play Station. What is your preferred addition? Spinach, smoked salmon, bacon, ham, mushrooms, or even the decadence of truffles grated on the top of the Hollandaise, or braised in the butter before adding to the beaten eggs for Hollandaise Sauce? 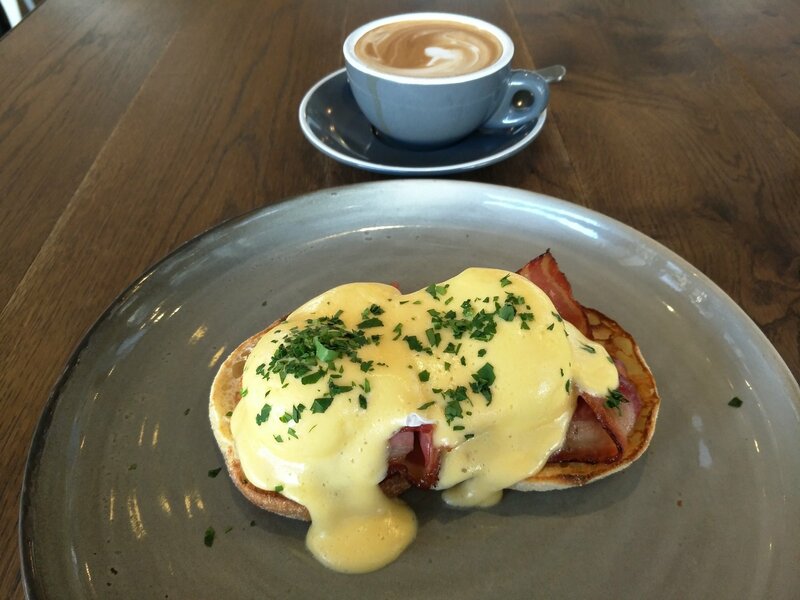 And just where is your favourite place to indulge in Eggs Benny in Canberra? Hands down the manhattan near glebe park is the best in town. I think they cure their own salmon. Thanks so much for adding your recommendation. I have been there a few times for lunch – next time it will be Eggs Benny for me! I’m quite partial to a bit of seeded mustard in the Hollandaise. Yes, anice seeded mustard is an excellent addition to Hollandaise! I wonder if that has another name? Tarragon and a bit of vinegar changes Hollandaise to Bernaise, and of course, stirring through chives, parsley or even grated truffle is always a nice change. 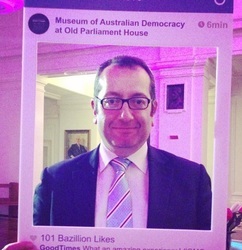 Thanks for another great suggestion Elias! I have to admit to being a very ‘hit and miss’ poached egg cook. I have literally tried every method including microwaving in a mug (not really recommended); boiling in cling wrap; with vinegar/ without vinegar; in funny little “revolutionary egg poaching bags”; and metal rings in a fry pan. I have watched endless Youtube ‘how to’ videos, and tried Stuart Strutt-Shottons deceptively simple method of creating a vortex in the gently boiling pot of water. I haven’t quite admitted defeat … Fresh eggs are essential and I love Gunning Bum Nuts!